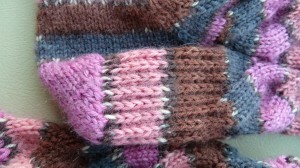 Home » Crochet, Knitting and Knotting » Socks, Socks and More Socks! In January 2009 we headed out for a epic journey in our motor home and, knowing my inability to sit for long periods of time without something to do with my hands, I made a stop at the local yarn shop before our departure. At that point in time I hadn’t had knitting needles in my hands for at least 20 years and I had never tackled ‘socks’ – lots of sweater, hats, afghans – but no socks! That winter I completed my first pair and if you didn’t look closely the ‘different’ heels weren’t noticeable. They have served me well now for three winters. Before Christmas I happened to notice that they were getting thin on the toes. Oh – oh! What to do? I checked the toes of a subsequent pair of socks and they too were getting thin on the toes – but not the heels! My third pair of socks were the same pattern as the pink socks below. They were given as a gift so no photo. My ‘hallowe’en’ socks, the fourth pair, were a toe up pattern from Cat Bordhi’s book “Personal Footprints” and I really like the fit of that pair. I was too far along to ‘reinforce’ the toes but as the ‘kroy’ sock yarn I used is heavier than the yarn previously used. I will see if they outwear pairs one and two. Bonus – the yarn was 99 cents a ball in a clearance bin in Michael’s last fall – $2 socks! As I completed these socks in the fall of 2011, I mulled over what to do with the thinning toes on my hard worn blue pairs of socks and, after a bit of research, decided to take a different approach for each pair. One pair I refurbished by doing a duplicate stitch in the worn area, the second pair I ripped out and reknit the toes using both the old yarn and a new strand – double thickness. I think I like this latter method better. 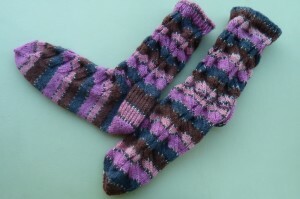 Since Christmas I have completed another pair of socks from ‘Kroy’ wool, this time using several patterns to get what I wanted. 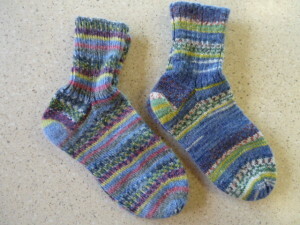 Last year I knit a pair of socks from the same pattern for a gift and used the short heel shaping. I discovered that, for my foot, this heel shaping just didn’t provide enough ‘depth’ for my high arch as the shaping doesn’t have a lot of give to it. 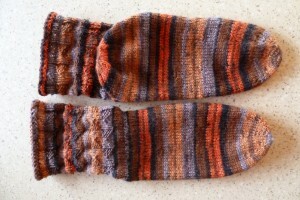 However I loved the mock cable design in the pattern – the Nutkin Sock on www.Knitzi.com. I knit a narrow band of ribbing at the top rather than the fold over top in the pattern, proceeded with the leg design but when I got to the heel I consulted another of my reference books “Sock Knitting Master Class” by Ann Budd and used the instructions for the heel flap with the standard Sl 1, K1 reinforcing stitch. Although I don’t wear out the heels it was a chance to try a new technique. I completed the sock with a side decrease and kitchener stitch bind-off. I was just completing the second sock when I discovered the instructions for reinforcing the toe with this stitch! So on to yet another pair of socks! This pair is back to a toe up pattern form Cat Bordhi’s book but this time I am trying something new. Instead of using Cat’s toe shaping I used the reinforced toe pattern that I found while researching repair methods. It basically is a round toe and used the same reinforcing stitch as the heel on my previous pair. I think I’m going to like it. Do you get the idea that I’m hooked on knitting socks? I’m still fascinated with the variety of technique used for shaping and it’s a great way to try out new stitch patterns….and my feet love the warmth when the weather is cool!